I think that this is my favorite Christmas craft yet. It was so simple to make too. My own Christmas cards that I'm making this weekend will be a spin off of this craft. To start, I mixed a few different shades of paint together. I mixed green with white, green with yellow, and then just used plain green. Unfortunately, the contrast didn't show up as much as I'd hoped on the finished product. Claire stamped the rim of a small glass in the paint and then stamped it on the paper. Three times, once in each different shade of green. When the green paint was dry, Claire used a q-tip that she dipped in red paint to make the berries on the wreath. I tied a small bow with a bit of red ribbon that I found in my stash. To finish the card off, I used a stamp and gold ink pad to stamp the words love hope peace joy. 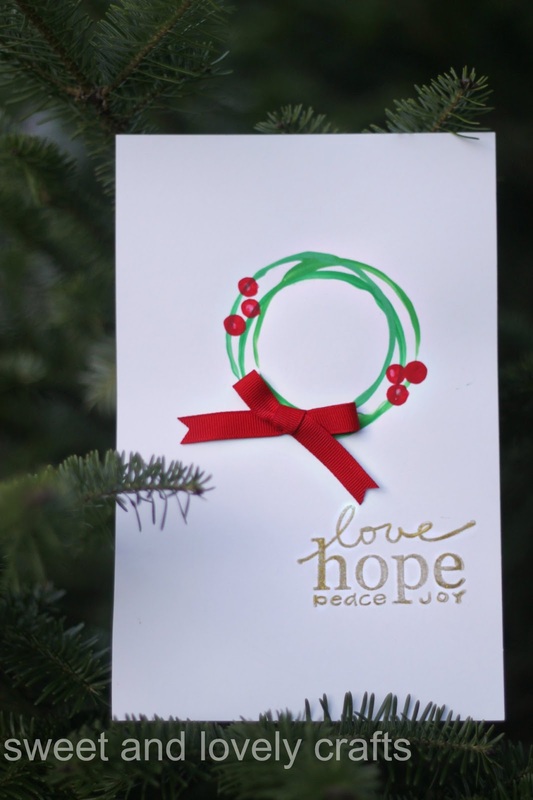 Are you making your own Christmas cards this year? I will have the kids make a few to send to their friends who don't live near us anymore. I love these cards :) So simple and just right! So cute! Can you share where you got the stamp and who makes it?